Victory Mercury Trophies. 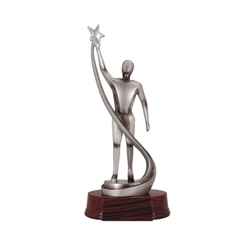 This modern abstract trophy makes a very special award for its recipient to celebrate success. Metallic silver finish, non gender specific, fluid design, high quality rosewood finish base. Available in 13.5" size. Your text is added to a silver metal plate which is attached to the base of the trophy. Approximate Base Dimensions - 3" wide x 1 3/8" tall.